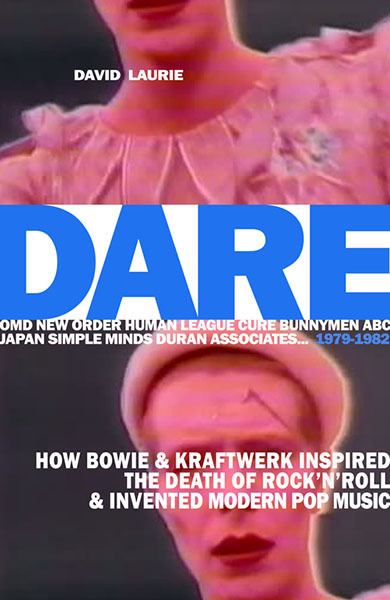 Just finished an uplifting book about the early 80s music scene in Britain, Dare: How Bowie & Kraftwerk Inspired the Death of Rock'n'Roll & Invented Modern Pop Music. 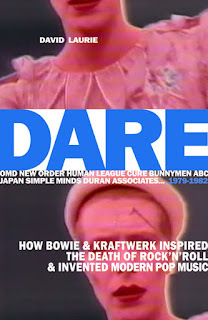 I love the contrast between perfunctory title (Dare - perfect; after the Human League album of course, which kind of defined the period) and the mouthful that follows. And you can tell he really tried to shorten the latter, getting rid of 'David' and changing 'ands' to '&s' or 'n's. I'd go along with the Bowie/Kraftwerk argument actually, though the last time I looked, Rock'n'Roll was still hanging on in there. The early 80s were an amazing time for pop music - post-punk and pre-stodge. The Jam, XTC, Madness, 2-Tone, Ultravox, Depeche Mode, Yazoo, Human League, Heaven 17, OMD, Cherry Red, Japan, Soft Cell, New Order, Eurythmics, Thomas Dolby, Blancmange, Associates, Malcolm McLaren, Scritti, ABC, Tears For Fears, Simple Minds, Siouxsie, The Cure, Cocteau Twins, The The, Postcard, Crépuscule, Rough Trade, 4AD, Some Bizzare, Fetish, Cherry Red... to say nothing of the more obvious Duran, Spandau, Culture Club and the less obvious Eno's On Land, Throbbing Gristle, Cabaret Voltaire, Eyeless In Gaza... In 81/82 the Top 5 included weird stuff like Kraftwerk's 'The Model', Japan's 'Ghosts' and bizarrest of all, Laurie Anderson's 'O Superman'. And now? David Laurie's style took a little getting used to. It's very personal, casual, more like the longest ever pub conversation than a book, full of "oh my"s and "do yourself a favour"s, and even a few F words, but I liked it a lot. The tone of an enthusiast. Like classic Kurt Vonnegut, he mostly likes to keep his prose short, sweet and droll (much of it is laugh-out-loud), but occasionally surprises with a long eloquent sentence which absolutely nails an argument. thanks man. what are you writing about?